The Durium Children records turn up now and then and record collectors like it because these 4 inch ( = 10 cm ) records is childlike too. They have the same size as the known DURIUM JUNIOR, but they are not labeled as that. When I overlook all Durium issues worldwide there have been some releases special made for children. 1. The DURIUM MOTHER GOOSE. Singer Frank Luther. This series of six 4-inch ( = 10 cm) records was released early 1932 in the US. They has been exported to Europe and released ca. 1933 with a different label credited as DURIUM MOTHER GOOSE by UNCLE TOM. 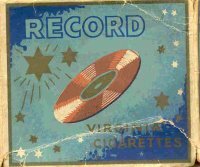 This series of six 4 inch ( = 10 cm) records was released in 1932. It is of some interest that, although the labels differ, the reverse seem to be copies of the US ones. These are round 4" records sold in two illustrated envelopes. Each set of three costing 6d. On the reverse of each record pictures to illustrate the songs. // Mind that there exist two records with the matrix E 5023. There are stil a lot questions about the Frank Luther, Uncle Tom, Uncle Ajax and Harry Hemsley children records. Due to the fact that only few collectors ( maybe none ) have all three releases in their collection it is very difficult to compare the small records and the voices of these two or three (?) persons. A series of three little records for the Swedish market. The title means Santa Claus plays and sings for the young ones. “Tomtegubbarna”: "Santa Claus" vo. Rest unknown. Another series of 3-inch records ( = 7,3 cm) released as an extra by “Force”, Sunny Jim’s famous multi wheat flakes food contains some children songs. There are some more incidental advertisement records that are fix its eyes on children. There have been a series of fables made for the Italian market released on Durium in the second part of the 1930s and it seems that these fables were reissued in Italy on LPs in the 1950s. A special website dedicated to Children records is Kiddies Records Enjoy it.